November 10, 2012: The Diamond Exchange #8 | Esc.rec. November 10, 23:00-3:00 hrs. 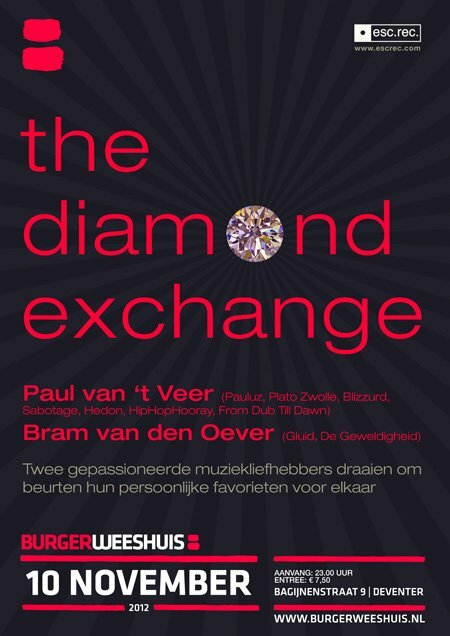 in Het Burgerweeshuis, Deventer: The 8th edition of The Diamond Exchange, with Paul van ‘t Veer and Bram van den Oever. Two musical centipedes. Under his Gluid alias, Bram van den Oever proves himself to be a master of sound editing and composition, and he released a number of internationally acclaimed albums through esc.rec. to back that claim. In addition he composes soundtracks for theater and such, and is a part of the many-headed sampletrashmonster De Geweldigheid. Bram’s personal record collection is overwhelming. A collection that is largely fueled by Plato Zwolle, where our second participant of the evening works. Like Bram, Paul van ‘t Veer (better known as Pauluz) is a musical omnivore with an awe-inspiring record collection. Pauluz is a versatile DJ with a preference for pop, soul, funk, hip hop and electronica. He is currently (co-) organizer and DJ of Blizzurd, From Dub Till Dawn, Sabotage (all in Hedon Zwolle) and HiphopHooray. Previously he was also organizer of Ultimate B-Boy Breakdown and Grand Concourse (Hedon). Expect this edition of The Diamond Exchange to be an evening of musical discoveries and surprising moves! You have to pay 7,50 euro to get in, but then you also get to enjoy Deventer Dub Sessions with Soundstream + Sense Unique & Ferdi Blankena.